First things first, if you are a festival lover then you might find me a spoilsport. Festivals are celebrated to signify something very important for a religion (Birth of Christ, Return of Rama from exile, Birthday of a Prophet) etc. or to ensure unity (Ganesh Chaturthi etc. ), and at times to signify a spiritual change (Samadhis, Dikshas/Shobha Yatras exercised by several religions including Jainism). Next the question- Why are festivals celebrated? The intention behind every festival is good. It takes human understanding to the next level. In several occasion it also becomes a reason to spread happiness by meeting and greeting your extended families. Some even cleanse by exercising fasts to purify not just your mental state but also your physical being. While I act like an atheist but I am spell bound by the way these festivals were made and how they unknowingly benefit us in several ways. And with several generations these good habits have been passed on to us in the name of the almighty! With all these facts well understood and especially the essence of it all, let us delve into the way festivals are being celebrated today. Most festivals are loud. If Diwali (as celebrated in the darkness of New Moon night) is a festival of lights; let’s burn as much oil as possible. For sound, the crackers have to be loud enough to turn you deaf. While festivals should start a new period of more clarity, they generally spread dirt and filth. 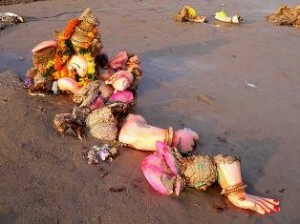 From the Ganesh idols in the west to the Durga idols in east, no stone is unturned to pollute the sea. The air is polluted, so is the water, the sound is polluted and so is the very essence. Pollute the culture A BIG WAY! A Ganesha who united the communities with Chaturthis, today the same divides and colonizes the community with one Ganesh Pandal in every society. The deities today are highly political. From Ganesh Chaturthis & Janmashtami to Eids, every festival starts with blocking all roads to display your political prowess. While political posters are legally not allowed in India, every political party has larger than life posters displayed during these festivals (Yes somewhere down the corner you do find a Ganesha or a Mosque illustrated too). The Bhajans and chants that were started by our fore fathers have changed recently. During the last Ganesh and Durga Visarjan following were the chants I heard while coming back home with my sister and wife. Zor se bolo Jai Mata ki, ‘Item’ Bole Jai Mata ki! These chants are shouted in several lanes in Mumbai and for those who don’t understand Hindi let me highlight that these are a milder way of eve teasing! Here goes the social policing out of the window. 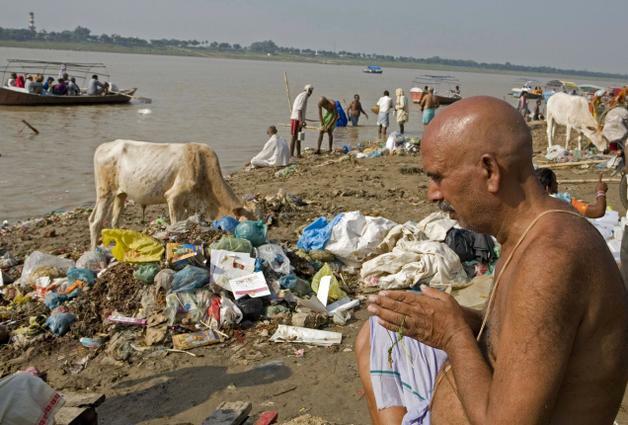 All of this is happening while the same devotees criticize gang rapes happening around. Are these real devotees? No paid political slaves to be precise. While I talked about colonization that Ganesha brings there is more to it. Festivals are no more a reason to get together. You have your exclusive Ganesha Pandals, Preferred and paid Dandiya grounds, preferred political tie ups to sponsor your Christmas and Eid. Everything is very exclusive. Another example is the procession that happens when a member from the Jain family decides to leave the mortal world and go spiritual. It is an important day. You decide to renounce the materialistic world and join a life of asceticism and self-exploration. If you have seen a Jain monk you know they don’t even wear footwear and have a Rajoharan (a broom of woollen threads) when travelling so that they accidentally don’t kill unnoticeable insects on the road. While the life of such a monk is one of solitude, the start isn’t anything close. Hundreds of pennies are tossed from a Silver and Gold Chariot to announce to the world about this event. I have myself witnessed several peasants ending up in physical brutal fights for a few pennies dropped on the road while the monk leaves for sanity and solitude! I believe I have highlighted several instances where the mere meaning of festivals has been tweaked. It is not just annoying but unbearable. Should Festivals be banned? No I am not an extremist, but the way we are going ahead it needs serious cleansing! While we are talking a lot about changing the world, it is our moral responsibility to start the change at home; and a spiritual responsibility to start with ourselves/our minds. Why not re-think the HOW to manage a festival and evolve them to this day. With great technology, better intelligence and a matured responsible behaviour; I know for sure we can make these Festivals extra special and take the race ahead as visualized by our fore-fathers. Welcome to the Festival of Change! Loud, polluted and definitely commercial. From being excuses to meet & plan independence struggles, and from occasions to end hate and enmity and foster togetherness, festivals have grown to be occasions where people splurge and/or struggle just to keep pace with what everyone else is doing. And with the price of everything goes through the roof, ever wonder how the poor cope with these festival-induced prices? And nothing to me is as disrespectful as seeing idols that are fondly decorated and prayed to on one day, lying broken in the mud the very next. If you look closely, festivals have become more of a break from the routine, than anything else. And finally, if we’ve celebrated the ‘triumph of good over evil’ so many times, how come evil only seems to be increasing? Picture story on Ganesh Idols abandoned post immersion, an environmental hazard.